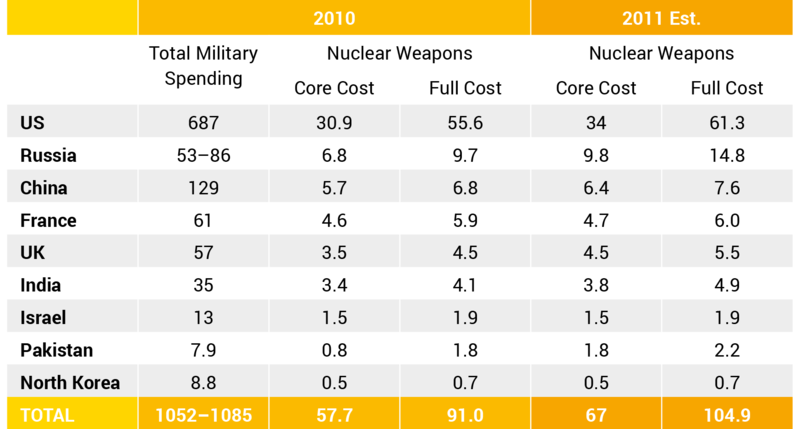 Despite the decline in the overall number of nuclear weapons since the end of the Cold War, expenditure in this field continues to increase. The numbers are alarming. According to a Nuclear Weapons Cost Study released by Global Zero in June 2011, global annual expenditure on nuclear weapons amounts to 105 billion USD annually or 12 million USD an hour. At this rate, we can calculate that nuclear-armed states will spend at least 1 trillion USD over the next 10 years. The significance of these numbers becomes even clearer when put into context. The annual budget of the UN Office for Disarmament Affairs is only 10 million dollars. And the target of the UN Green Climate Fund is to secure 100 billion USD a year – an equivalent amount to the global nuclear weapons budget. The figures released by Global Zero in 2011 are likely to be under-stated, and the actual expenses much higher. Since 2011, the US Congress has authorized additional nuclear modernization programs, the full costs of which are not included in the 2011 figures. The cost of French nuclear weapons programs (research, development, testing and production, deployment, command and control, communications and intelligence) between 1945 and 2010 was estimated at 357 billion Euros by an independent think-tank Observatory of Armament. France had, and still has, the world’s third largest nuclear weapons arsenal with 300 warheads, deployed on submarine-launched ballistic missiles (SLBMs) and fighter aircraft. All of these weapons are deployed and operational. Since 2003, the parliament votes a Military Planning Law (LPM), which defines the defence budget for the next six years. The last one was voted on in the fall of 2013 and covers the period from 2014 to 2019. 23.3 billion Euro are devoted in this LPM for the deterrence policy. In the previous period (2009-2014), the amount was 20.25 billion Euro. The explanation of the increase in the budget is that it is the result of the modernization of submarines (adaptation for the new M51 missile) and the production of two kinds of nuclear warheads. Also, to be added is the cost of the budget for the nuclear test simulation program, which began in 1995. The cost of this program was originally less than 3 billion Euro and has now reached 7.2 billion Euro. The next president will have to make major decisions, to prepare the renewal of all nuclear components. The objective is to have the first nuclear submarine of the third generation ready to use by 2030 (then 3 others will be built by 2045), and a new nuclear cruise missile planned to enter service in the 2030s for the Rafale fighter. The deterrence budget will thus be doubled to 6.5 billion Euro from 2020 until 2040. Belgium, Italy, Germany, the Netherlands and Turkey. These five NATO states are not nuclear-armed states but host American-owned nuclear weapons on their territory, capable of being used by the air-forces of the host countries. The other NATO states – as well as Japan, South Korea and Australia – are under extended-nuclear deterrence (nuclear umbrella) relationships with the United States, but do not host US nuclear weapons on their soil. The United States spends approximately 100 million USD per year to deploy 184 B-61 nuclear bombs in the five nuclear-sharing states. In 2010, the US National Nuclear Security Administration initiated a modernization program of the B61. The Federation of American Scientists described this program as “a gold plated nuclear bomb project.” The initial estimated cost was 4 billion USD. In 2012, it had already increased to 10 billion USD. The B61 nuclear bomb is not only being modernized. A new version of this bomb is being developed. It will be called the B61-12 and will possess a guided tail kit to increase the accuracy of the weapon. This will cost an additional 1 billion USD. Once the B61-12 is ready, another 1 billion USD will be spent in order to integrate the new weapons onto US and NATO aircraft. This sum includes, for example, software upgrades and operational flight tests. This is not all. NATO has already invested over 80 million USD since 2000 to secure nuclear weapons storage sites in the nuclear-sharing countries. And according to the US Department of Defense budget request for 2015, another 154 million USD will be disbursed so as to meet stringent new US safety standards. One crucial element missing in all these numbers is the financial contributions of the five NATO states hosting the US nuclear weapons. Costs for the host country airplanes required to deliver the nuclear weapons are generally known, and parliaments can play a role in policy decisions on whether to maintain this role (see Chapter 6). However, other costs of the host countries relating to storage of the weapons are not public. This is a suitable topic for parliamentarians to raise questions.